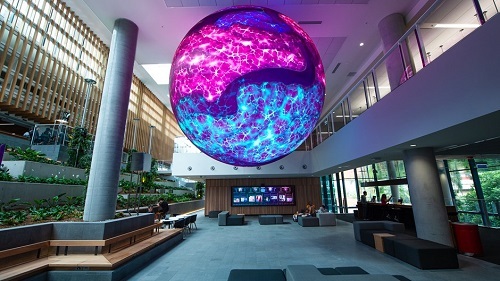 The Queensland University of Technology (QUT) has unveiled its new $94.4 million Education Precinct building located at its Kelvin Grove Campus in Brisbane, offering teaching and learning opportunities in a world-class environment. The Faculty of Education and QUT’s Aboriginal and Torres Strait Islander Oodgeroo Unit are housed in the state-of-the-art, six-level building, spread across 10,500 sqm. Designed by Wilson Architects and Danish firm Henning Larsen Architects, the project is a model for educational precincts internationally and sets a new benchmark for contemporary and sustainable design. Robin Sweasey, National Head of Education for Turner & Townsend and Senior Project Manager for QUT’s Education Precinct development comments: “The project was a collaborative team effort over a four-year time frame with all team members and stakeholders working together to deliver the very best outcome for the university. QUT Vice-Chancellor and President Professor Margaret Sheil said the university was excited to welcome students this semester to the new precinct. “This is a significant investment by the university in enhancing the student learning experience and continuing to provide quality teaching and education,” Professor Sheil said.